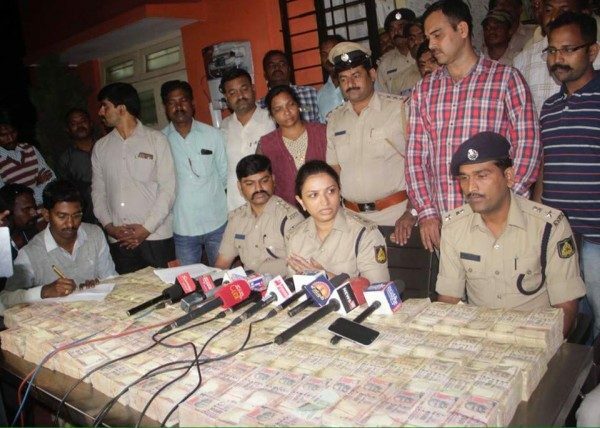 Demonetised currency worth 3 crores 11 Lakhs seized from a room of hotel Rohan Residency and 6 persons have been arrested. The City Crime Branch police raided Hotel Rohan Residency and the arrested were in room no 204. Speaking to the media Deputy Commissioner of Police (Law and Order) Seema Latkar said the CCB team led by Inspector B R Gaddekar raided room number 204 in the hotel after a tip off. The arrested have been identified as Arvind Pundalik Talavar (33) of Goa, Suhas Ashok Patil (31) of Pune, Rama Bhairu Patil (29) of Halga-Bastwad in Belagavi, Saddam Husain Shaikh (28) of Miraj, Anil Jayantilal Patel (29) of Gujarat and Abudl Nasir Mohammad Basha (52) of Bhatkal. The police are still investigating the matter and it is believed that Anil Patel is the king pin of this racket. This is one of the biggest seizure of demonetized currency in Belagavi.